Perianayagiammal, one of Anisha's staff members, keeps track of weekly community savings collected at a self-help group meeting. Anisha works in 20 villages and runs community self-help groups in 14 of these. Each group consists of 10-20 members, generally either all women or all men. (See above women of different villages in saris of different colour.) In these groups, farmers and women are able to share their farming and gardening experiences with each other, trade seeds, provide support and advice on applying organic techniques, and encourage each other as they move away from dependency on chemical practices to complete independence of costly external factors. The groups also run a credit & savings programme, something very popular in Asia. At each meeting, members give a small amount of money, which a group representative deposits in a local bank. In this way, members are able to start building some fiscal security to help them get out of debt or save for emergencies or big purchases. Anisha is also providing a revolving fund to help set up micro-enterprises. Repayment morale is very good - the fund is run by the women themselves, who also decide who will receive a loan. 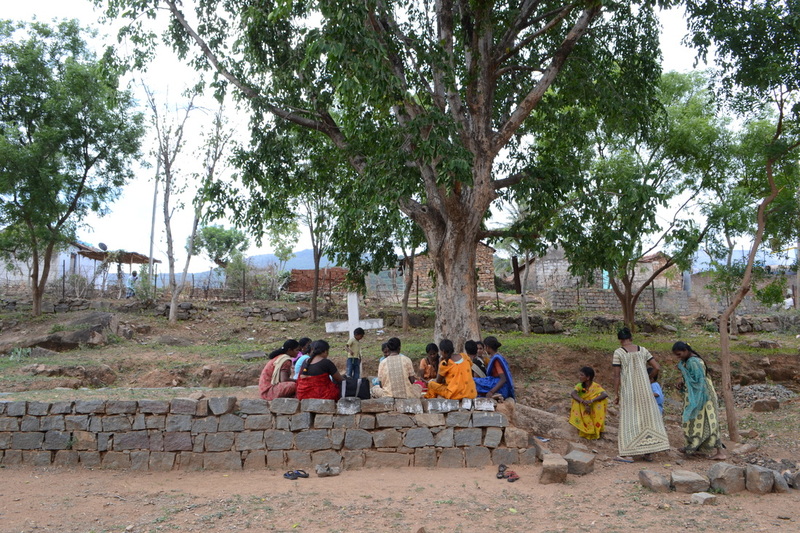 The self-help groups meet in common spaces in neighborhoods throughout Martalli. Little children often accompany their mothers to the women's groups.